Some types of lisps (frontal and dentalized) can arise during normal development. This is not the case with lateral or palatal lisps. When vocalizing the “s” and “z” sounds, a child with a lateral lisp directs air flow over the sides of the tongue, rather than straight down the middle of the tongue. This is often a result of incorrect tongue placement. Speech-language pathologist (SLP) Caroline Bowen notes that children with a lateral lisp often use a tongue placement for the “s” and “z” sounds that is quite similar to the tongue placement for an “l” sound. Your child’s speech therapist will likely begin treating a lateral lisp with auditory discrimination training. The speech therapist will help your child learn to discriminate between the proper and improper pronunciations of the “s” and “z” sounds. She will likely have your child work on articulating these phonemes by themselves. Your child will progress to articulating these sounds at the beginning, middle, and end of target words. Your child’s SLP may also use tactile feedback to help your child with proper tongue positioning. Seal Speech Buddies provide a target in your child’s mouth so that he knows when his tongue is in the right place for proper articulation. You can also use Speech Buddies at home. In addition to the Seal Speech Buddy, you can do other activities at home to help encourage your child’s progress. Hold a feather in front of your child’s mouth and instruct him to blow air through the front of his mouth to move the feather. You can also play pretend games with your child to encourage proper air flow. Have him to pretend to pull a piece of string straight out of his mouth along the front teeth. Instruct your child to hiss like a snake while he does so. Every time you get your child a drink, give him a straw. 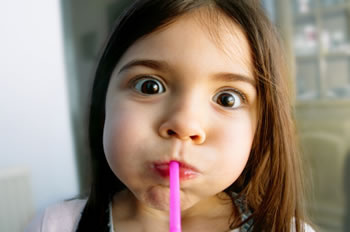 Before giving him the drink, have him place the straw directly into the front of his mouth, underneath the front teeth. Encourage him to direct air flow into or along the straw.